I abhor the thought of smacking a child, or caning, or any form of physical punishment. I have never used it, and I have never had the feeling that I needed to resort to it. The way I explain my position on it is to ask how you would feel if your boss whacked you every time you made a mistake? I imagine you would be devastated, and might follow-up by resigning and taking legal action against your (now) ex-boss. I am often told that the bible says "spare the rod and spoil the child" as a justification to use corporal punishment. Actually, the bible does not say that anywhere, it's a myth, and my usual response is to ask how many children do you think Jesus caned? It's equally hard to imagine Buddha bashing up a kid. Another thing I hear is "I was caned as a child and it didn't do me any harm". Well, maybe that's true (who knows), but study after study proves what many of us have always known intuitively - that violence begets violence. Not only that, but it also damages the bond between parent and child. It's not normal to love someone who hurts you. The world is changing all the time and what we as parents, nannies and child carers are trying to do is raise the next generation in a loving and secure environment, where they learn cooperative behaviour and how to resolve conflict effectively without resorting to physical means. Managing naughty children can be difficult and I realise that parents often hit their kids out of frustration rather than out of a belief that it is the right thing to do, but there is a better, much more effective way. It's called giving time-out. It is not a harsh punishment, but it does show who is in control, it won't leave lasting psychological scars and it can be very effective. Before giving time-out, you should give a stern verbal warning explaining that what she is doing wrong, and that repeating the behaviour will result in time out. If the behaviour is repeated, don't give a second warning. 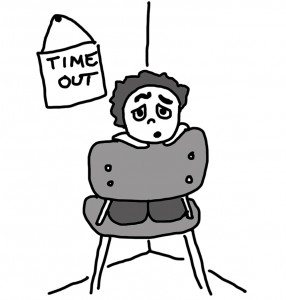 The time-out strategy works by immediately removing the child from the stressful situation and placing him in a familiar "time-out" place which may be a chair, a corner, or - for older kids - a room. It is here that they can simmer down after a tantrum and think about what just happened, and what would have been a better response. By removing him from the scene which is the focus of activity in the room, you are demonstrating to him that this method of trying to get attention definitely will not work. When you plonk him down into his time-out spot, bring your eyes down to the level of his and tell him firmly that he has to sit there for a while and think seriously about what he has done. Even though the activity may be continuing around him, do not let him join in, don't speak to him or even acknowledge his presence for at least a few minutes. Then you can approach him again and ask him to explain what it was that he did wrong, and why he must do that any more. When you see that he has understood your message, you should ask him to apologise. After he has apologised comes the best bit. Pick him up, or give him a brief hug, and tell him you are pleased he understands why a time-out was necessary, you are proud of him, and he can now re-join the play activity. Giving time-out is the most effective way of correcting bad behaviour that I know of. It teaches how to cool-off, how to think about the situation, and what was wrong with his particular behaviour. And the best part is you have not weakened the bond of love between the two of you. In fact you have strengthened it.